A team of experts has pieced together the architectural context of two treasures of Renaissance art in the National Gallery collection. The research behind the 3D-visualisation combines traditional and digital methods – and benefits from invaluable input from the local community. One of the most exciting moments was when the owner of an apartment opened the door of an airing cupboard to show us some stone steps inside. An exhibition at the National Gallery tells the story behind some of the most remarkable examples of religious art in its collections. Two large-scale paintings from the 14th and 15th centuries, which show scenes of the Assumption and Coronation of the Virgin, originated as altarpieces in the church in Florence called San Pier Maggiore (or Saint Peter Major, so named to distinguish it from other churches dedicated to the Apostle Peter in the city). Until recently little has been know about San Pier Maggiore as the setting for these masterpieces. Once one of the city’s oldest and most important churches, it was demolished in the 1780s to make way for a market place. Now detective work has enabled a team of academics and curators to produce a virtual reconstruction of the church complete with its bell tower which would have been a prominent landmark. As an important church, San Pier Maggiore had been endowed with splendid altarpieces, commissioned by rich patrons. Today these paintings are dispersed around the world. The National Gallery in London holds The Assumption of the Virgin, painted by Francesco Botticini in the 1470s and The Coronation of the Virgin, painted by Jacopo di Cione a century earlier. The exhibition at the National Gallery is accompanied by a short film which explains some of the challenges that faced the small team who undertook the virtual reconstruction. Combining their skills were Dr Donal Cooper (Department of History of Art) and Professor Francois Penz (Department of Architecture) from Cambridge University, Dr Jennifer Sliwka, assistant curator in Renaissance painting at the National Gallery, and Dr Miguel Santa Clara, a film-maker and graduate of Cambridge’s Department of Architecture. As an art historian of Renaissance Italy, Cooper knows Florence well. But when he arrived in the city in the hot summer of 2015 to begin the research, he felt disheartened. Walking around the area where the church once stood, he could see the arches of the elegant portico that was added to the church in the 17th century and a number of piers enveloped by later buildings. But there seemed to be few obvious clues to help create a clear picture. Cooper was joined in Florence by Penz, Santa Clara and Sliwka. The team’s fortunes began to change when they met café owner, Ricardo Camporesi, whose premises act as a hub for the local community. A flyer was distributed in the neighbourhood. It asked people to get in touch if they were willing to open their houses to the team. The response was overwhelmingly positive and the team was invited into several apartments and businesses. The spiral steps in the cupboard led upwards to a small roof terrace with a view over the city rooftops. The 40 steps that remain today are part of a stairway that was originally inside a 14th-century bell tower or campanile. The people of Florence were hugely enthusiastic about the project and the Florence edition of Il Corriere della sera carried a three-page article about it. But the team is keen to avoid the temptation of filling in the gaps in their visualisation. “One of the key research aims was to visualise degrees of uncertainty in the 3D virtual representation of the church, reflecting a variety of hypotheses invariably present in art historical research of this nature. And this why we used the point cloud modelling technique that allows room for the imagination,” says Penz. The project was funded by a Cambridge Humanities Research Grants Scheme Research grant together with a Kress Foundation grant to the National Gallery. 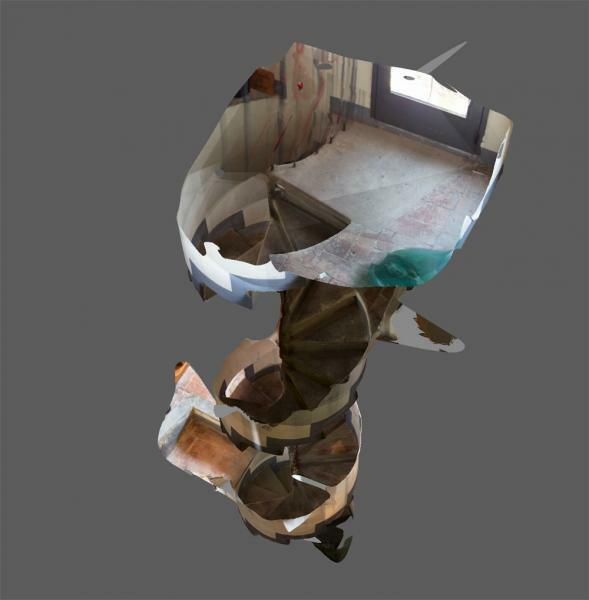 Inset image: Campanile staircase photogrammetric reconstruction. Jacopo di Cione’s polyptych, originally more than 5 m tall, was one of the largest altarpieces ever painted for a Florentine church. The central scene depicts the Virgin being crowned as Queen of Heaven by Christ. The so-called ‘Coronation of the Virgin’ was believed to have occurred at the Virgin’s death and Assumption into Heaven. The Virgin and Christ are surrounded by saints and angels, with pride of place given to St Peter, as the titular saint of the church. Jacopo painted the apostle holding not only his traditional attribute of the keys of heaven, but also a miniature representation of the church of San Pier Maggiore. Botticini’s altarpiece also depicts the Virgin being crowned in heaven, albeit in a very different fashion, set amidst ascending circles of angels and with an expansive landscape showing Florence and the surrounding countryside filling the base of the picture. In Cambridge, the Fitzwilliam Museum owns another painting from San Pier Maggiore. Tommaso Mazzuoli’s Visitation (1560) is on permanent loan to Trinity Hall where it serves as an altarpiece in the college chapel. Others paintings from the same Florence church are in Russia and the USA. 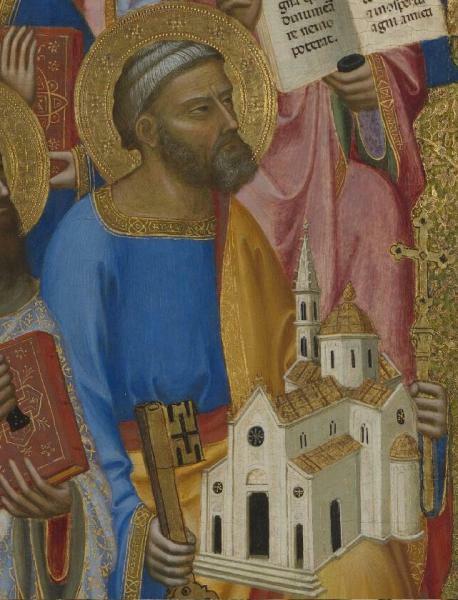 Inset image: Jacopo di Cione St Peter (detail).